I have been wanting to come to the Odd Fellows Cafe since it opened. Well this past week I finally had the opportunity to try it out. I went there on a Thursday evening and the cafe was pretty busy. Odd Fellows Cafe has cafeteria-style seating with tables in rows and old wooden benches. The space has very high ceilings and tall windows. The space is great. I love the fact that most of the original architecture. The only bad thing about the high ceilings is that it can get quite noisy in the cafe, but I love the feel of the place. You can definitely get a feel for the history of the building that was built in 1908. I ordered the half chicken. The chicken was cooked perfectly and it was very juicy. There were only two things I think they could have improved on with this dish. First, they should change the name of the dish to quarter chicken, or start purchasing larger chickens. The portions seemed pretty small for a "half chicken". 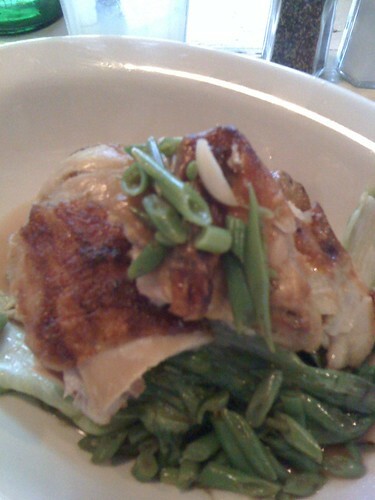 I was actually still hungry after eating all of the chicken offered and all of the green beans. The second improvement is to add some spice or rub to the chicken. Although the chicken was cooked perfectly, it didn't really have that much flavor. 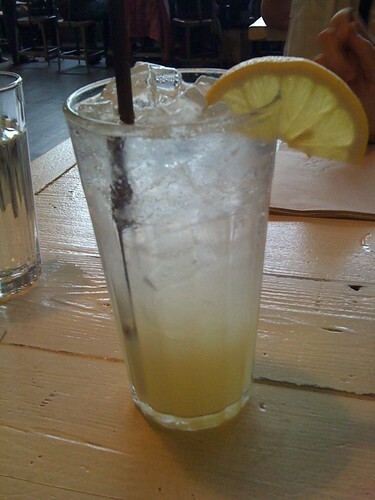 The lemonade I ordered with my dinner was tasty. This was just my first visit so I will definitely come back to try some of the other dishes on the menu. 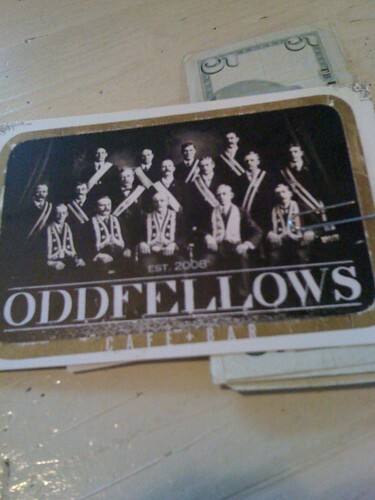 I love the atmosphere of Odd Fellows and I hope some of the other food items they have to offer match the atmosphere. Just found Odd Fellows Cafe this week. I really enjoyed our meal, and just wish we lived in the neighborhood so we could casually stop by for a beer in their courtyard this summer!